Doors open at 8:30 and the show begins at 9:00 p.m. Dancing / Standing show with limited seating. Tickets online, by phone or in person at the Miners Foundry, or at BriarPatch Co-op. 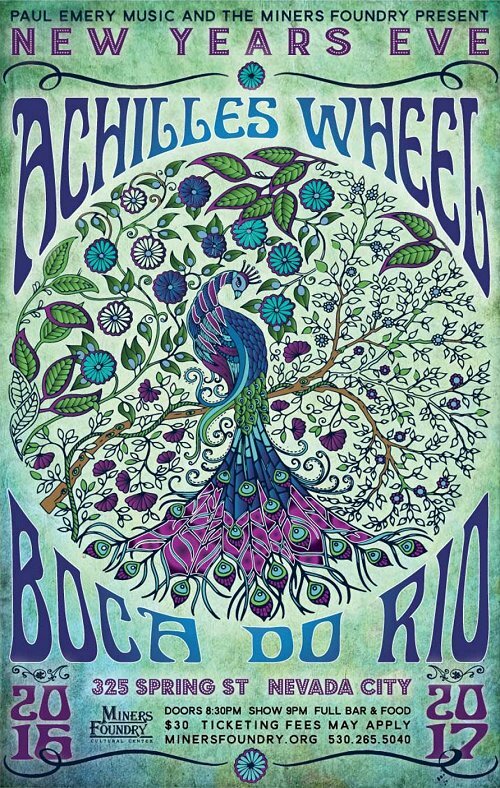 Paul Emery Music and the Miners Foundry will present Achilles Wheel and Boca do Rio at the New Year’s Eve Bash, Saturday, December 31, 2016. Boca do Rio is the Mission’s longest-playing and hardest-hitting Brazilian-American funk band. Nevada City favorite Achilles Wheel is a rock and roll band that blurs the lines between genres and fuses an infectious blend of Roots and World Music, Rocadelia. Achilles Wheel is a California based rock and roll band that blurs the lines between genres and fuses and infectious blend of Roots and World Music, Rockadelia. Their sound comes across as both Old School and New School, and is riddled with great songwriting. Achilles Wheel places supporting the benefit of the human condition foremost in their work. The idealism the band embraced as younger men has not diminished in the harsh light of the modern world as we struggle to live freely, have a good time, and hopefully matter in the end. Achilles Wheel fearlessly sings out to these times. Boca do Rio has a strong foundation as the Mission’s longest-playing and hardest-hitting Brazilian-American funk band. After a decade performing all original material during the heyday of San Francisco’s life music scene, Boca do Rio has evolved into a multi-layered electro-funk party boat with a sound that is fluid and edgy, adaptable and free. Born of the mixing of waters of Brazil and the San Francisco Bay, Boca do Rio has created musica organica – music that developed through the rhythm of living and working between the Americas.